I am currently spinning for a secret project. I appreciate that this is not ideal fodder for a brand new blog, but I’ll share what I can without giving the game away. Always up for a challenge, I’m using mostly fleece from my Dad’s flock of Jacobs and Jacobs X. 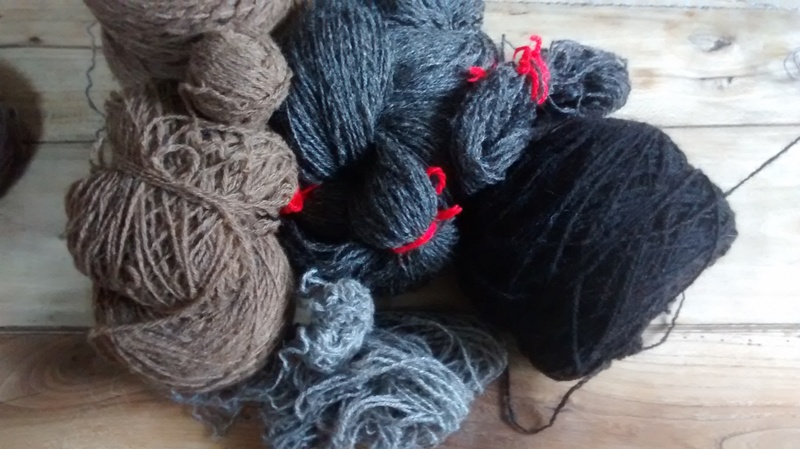 This is augmented with a Castlemilk Moorit fleece for the reddish brown moorit colour, and a Black Welsh Mountain fleece, both picked up at my Spinner’s Guild sale. From this starting point, some colours were blended to provide the nuances of colour. I even ordered the shade card so I could get the colours exactly right – this is serious stuff! For the white I’ve used a light Jacob’s fleece from Dad’s flock. I don’t think I’ve had a fleece from this ewe before – it’s very fine for the breed, not much crimp, but nice and soft. The pattern calls for 344m and I’ve spun 410m. I’ll be changing the pattern a bit towards the end, so this may not be quite enough. I also need 344m of Mooskit. To achieve this colour I’ve blended about 60% of the Jacobs white and 40% Castlemilk Moorit. I’ve started knitting already so there’s not much left! 144m spun already, so 200m to go. The Shaela was easy. This came from a lovely fleece, again from Dad, that I’ve used before – the ewe probably has Jacobs somewhere in her ancestry but it’s by no means a pure bred flock any more. I seperated the lightest grey locks for the Shaela, and used the darker locks for the Yuglet shade. Stats for these (because I know you’re fascinated) are: 143 / 344 m spun of Shaela, and 113 / 421 m of Yuglet spun. Next up is Moorit. 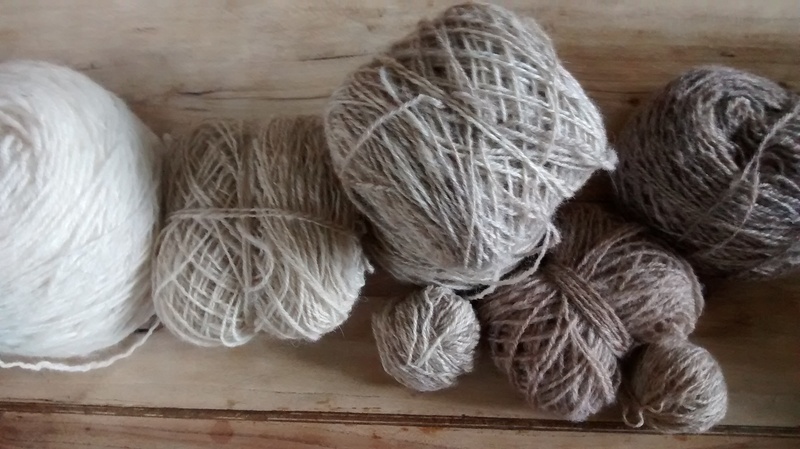 For this I used a Castlemilk Moorit fleece. I don’t think it’s quite as reddish brown as the Shetland Moorit, but the contrast is good against the other colours. I got a bit carried away with this one – I needed 688m and have a whopping 991m! I predict some Moorit hats in my future. The black was pretty tedious to do as the fleece required a lot of prep. I used a Black Welsh Mountain fleece, and it was a good fleece. Unfortunately, as with many of the dark hardy breeds, the fleece was quite coarse with a lot of kemp. The prep was slow with more waste than usual, but I did end up with a much softer fibre to spin. I need 688m of black, and I’ve spun 367. The modifications I’m making to the pattern mean that I should need less than the full amount – I plan to knit til I run out of this before working up the enthusiasm to prepare any more. Nearly there! The Katmollet was a mixed bag of Jacobs with browns and greys to which I added some white to lighten it up, and the Sholmit was the same without white. Katmollet 466m spun (from a required 344m), and Sholmit 187 / 344m spun. The savants among you will have already worked out that the pattern calls for 3861 metres of yarn in total, and that I’ve spun 2995 metres, but with my over-spinning of some colours I’ve only got 2504 metres of the colours I actually need. I’ve got a spreadsheet 😉 – it’s a lot of spinning, and it helps me to keep faith! I’m mentally calculating I’m 2 thirds of the way there. To just keep running with the maths, I’m spinning a 3 ply yarn which means that by the time I’ve finished I will have spun well in excess of 11,583 metres of thread which is more than 7 miles! No wonder I feel as though I’ve been spinning for this project forever. Here’s a picture of all the colours together, although there’s not much left of some of them, as I’ve done a fair bit of the knitting on this project already. 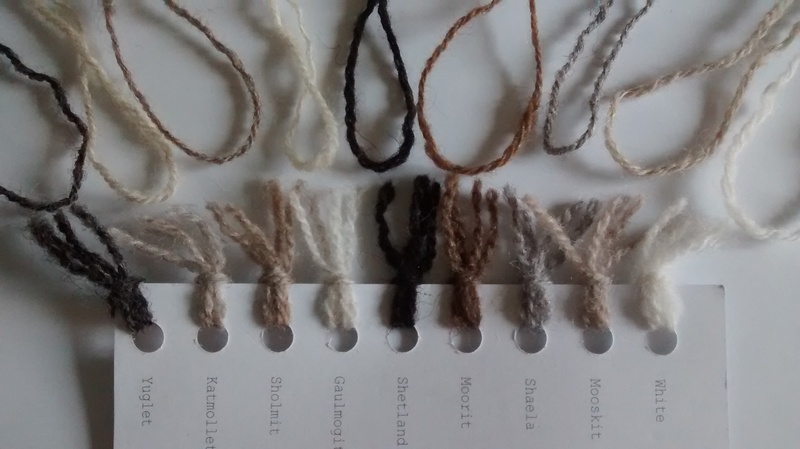 All in all, I’m pretty chuffed with the colours that I’ve achieved through blending and extensive rifling through my fleece stash. 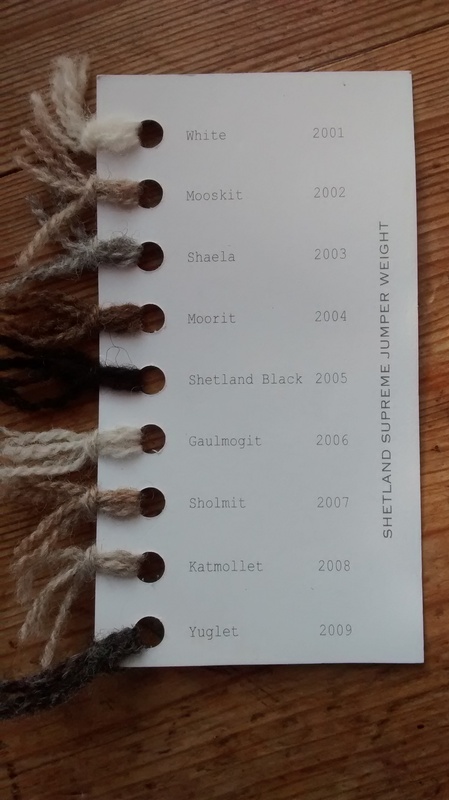 Some of the original Shetland colours were very similar to others, and I think I’ve maintained this subtlety of variation – of course, I could have just been staring at it all WAY too long! I’ll think I’ll tag posts about this project “secret project” for the time being, and when all finished and revealed I’ll change the tag to the something less mysterious. ← Something in the way he moves….